Download Income Tax Declaration Form 12BB for Employees. If you are employee of any company and going to file income tax return form, you need to fill Form 12BB which is new form announced by Income Tax Department of India for Employees to declare income tax. In Form 12BB, employees need to mention provisional statement about proposed investments they made in current financial year and expenses (which can be deducted in Income tax act). Effective from 1st June, 2016, Employees whose income are taxable (After investment and expenses), they need to fill IT Form 12BB to declare their income, LTA, LTC, HRA, Home loan interest, and other information which are listed in the Form 12BB. How income tax of Employee Calculated? As per the rules, currently Income tax of employee is deducted by Employer (TDS – Tax deduction at source) from their monthly salary (if the employee’s salary is more than income tax slab). And to calculate TDS income, Employer do count declared investments of employee and also calculates the expenses which can be counted in 80C and other income tax deduction acts of income tax India. Currently, Employees do not need to fill any form, just need to mention investment/expense in exempt allowance. But this practice will not be valid from 1st June, 2016, as now Form 12BB has been introduced by IT department of India. House Rent Allowance: - As per IT Act 10 (13A), House Rent Allowance get exemption from Taxable Income. You need to provide Rent receipts (if you are living on rent house), house owners name and address, amount you paid as a House Rent to be mentioned in Form 12BB. Note: - You need to mention House owner’s Pan Card number, in case your house rent exceeds more than 1 lac. - Leave Travel Allowance (LTA):- You need to provide all proof of travel expense you made from LTA money in 12BB form. - Home Loan Interest :- If you have taken home loan , you can exemption of interest paid for home loan under Section 24, Mention the amount you paid as an interest, your name and address and Pan card number. - Investments: - If you have made any investment which can be deducted under 80C, 80CCC, 80CCD, 80D, 80G, 80EE or 80E section of income tax, you can mention that in Form 12BB. - For Employers: - Central Board of Direct Taxes (CBDT) has clearly mentioned that Employers need to give proper evidence of the employee’s income and calculate the TDS according to that. - For employees :- if your income is less than income tax slab or if you have paid more income tax than your actual income at the end of financial year, you can claim Income Tax Refund. 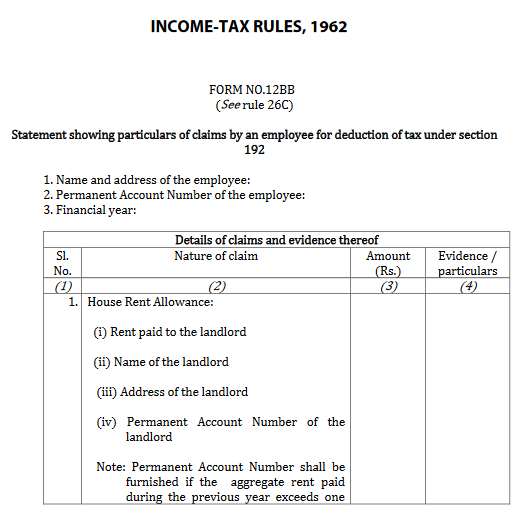 Employees can download PDF format of ITR Form 12BB from this link.